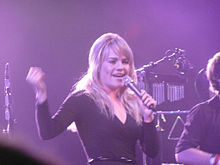 Amiee Ann Duffy (born 23 June 1984), usually known as just Duffy, is a Welsh singer-songwriter. Her first album, Rockferry, sold more than 6.5 million copies. Rockferry, and a song from the album, "Mercy", both reached number one on the UK music charts. Her second album did not sell very well, with only 200,000 sold in the UK. In 2009 she made an advertisement for Diet Coke. The ad caused problems because she is shown riding a bicycle at night without a helmet or lights. Journalist Luke Lewis described the ad as "...blank, sterile and mildly unsettling." ↑ Dean, Will (25 November 2010). "Duffy: Endlessly". The Guardian. London: GMG. ISSN 0261-3077. OCLC 60623878. Retrieved 6 November 2011. ↑ "Duffy tops UK charts once again". nme.com. 16 March 2008. Retrieved 6 November 2011. ↑ Fitzpatrick, Rob (27 October 2011). "When bands fall off cliffs". The Guardian. London: GMG. ISSN 0261-3077. OCLC 60623878. Retrieved 6 November 2011. ↑ Murray, Robin (17 June 2009). "Duffy Diet Coke Advert Cleared". Clash Music Latest Breaking Music News. Retrieved 6 November 2011. ↑ Lewis, Luke (3 November 2009). "Duffy's Diet Coke Ad: Watch And Shudder". Bored At Work?. Retrieved 6 November 2011. blank, sterile, and mildly unsettling. This page was last changed on 11 September 2014, at 22:47.